Pour a 1/3 of the coconut milk and the curry paste into a medium pot over heat and stir until you have a sauce. Add the rest of the coconut milk and hot water and then stir until well incorporated. Lower the heat when it begins to boil, add the spinach and cook for 2 minutes. You can add hominy or fresh corn. You can use frozen spinach, thawed and strained. Cook for 4 minutes and add them to the soup before serving. 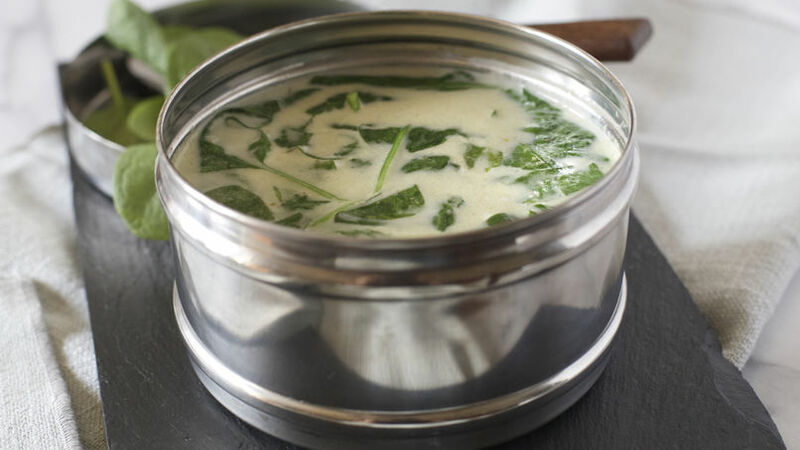 If you’re looking for a different, but delicious and easy spinach soup, you should give this Thai version a try. You can control how spicy it is by keeping an eye on the amount of curry you use. You can also use much milder yellow curry and add more vegetables. It’s a quick and delicious way to warm up on a cold day.